Liberals Ready to Kill to Get Your Guns! 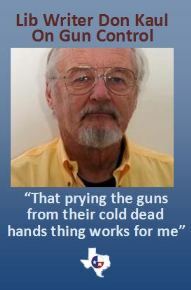 Writer Donald Kaul Goes Nuts with Radical Gun Control Proposal! Longtime liberal columnist for the Des Moines Register, Donald Kaul apparently suffered from brain damage when he had a heart attack back in July of last year. At least I hope that is the case and that liberals like him aren't really ready to go around killing lawful gun owners as part of a leftist anti-gun agenda. Kaul's wacked out comments came as part of a holiday season return-from-retirement posting entitled, "Nation Needs a New Agenda on Guns". 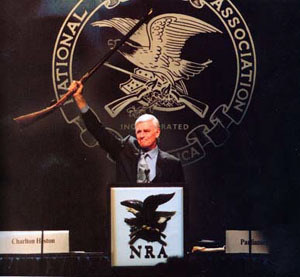 After suggesting the NRA be declared a terrorist organization and that Speaker John Boehner and Sen. Mitch McConnell be tied to the back of a pick-up truck and dragged around the parking lot until they "saw the light" on gun control, Kaul then said, "If some people refused to give up their guns, that 'prying the guns from their cold, dead hands' thing works for me." Is this where civil discourse and public debate is headed? Where, when people disagree with you, they will simply have you declared a terrorist, dragged behind a truck or killed to remove your legally owned property? But then, this is the kind of debate we are used to from the left. The left always complains it is conservatives who are "mean spirited" or make threatening comments; yet time and time again, history shows the left will resort to theatening to kill people, or otherwise put them in danger as in the case of the New York newspaper publishing the home addresses of legal gun owners in New York. How many people's lives have been endangered because of this reckless behavior. Most of the new gun control legislation, and even past gun control legislation seems to be aimed at rifles. Mr. Kaul, you are missing the real killer in this country... it isn't rifles, it's hammers and clubs. According to FBI statistics, 323 murders were committed with rifles. Yet during that same period, 496 hammers and clubs somehow wandered off the reservation and murdered people. Kaul claims the thing missing from the debate is anger. Mr. Kaul, the kind of anger you show in your article will do nothing but cause people to dig in their heals and wrap their hands tighter around their legally owned firearms. We don't need new gun-control laws. We need to arrest and punish criminals. The thing missing from the debate so far is anger — anger that we live in a society where something like the Sandy Hook Elementary massacre can happen and our main concern is not offending the NRA’s sensibilities. And if that didn’t work, I’d adopt radical measures. In his article he referenced Sen. Dianne Feinstein's radical gun control proposal I wrote about earlier this week. But in his opinion, the proposal doesn't go far enough. Mr. Kaul, I pray that you will seek treatment for the brain damage apparently done by your recent heart attack. As for now, you are doing nothing to add to civil discourse and I suggest you return to your pina colida's or what ever else it is you are drinking in your retirement. Or maybe, we should just start publishing the home addresses of liberal anti-gun writers. Short of eliminating all guns from the face of the Earth, there is not one single gun control law that would stop a person like the Newtown shooter from stealing a gun and setting out on a path of vengence. The only thing that stops a bad person with a gun is a good person with a gun. We need to eliminate "gun free zones" We need to vigerously enforce the laws that are on the books about the illegal use of, storage of or transfer of guns. You would be amazed at just how little these laws are actually enforced. We don't need new laws stripping the rights of law abiding citizens of this country. We need to punish criminals who use guns illegally.